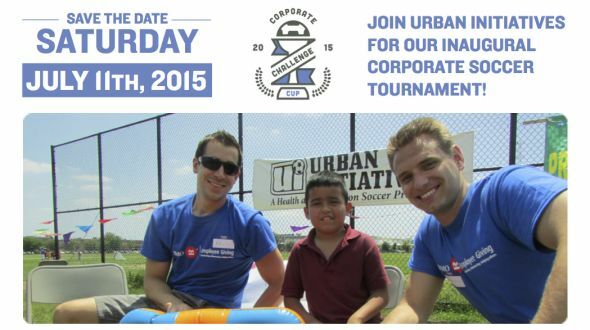 Urban Initiatives invites you to a a soccer tournament featuring friendly competition, team building, and representatives from 16 Chicagoland companies – the Corporate Challenge Cup. On Saturday, July 11, 2015 – in support of the 16,000 Chicago Public School students in Urban Initiatives’ programs – over 150 Chicago professionals will gather at Humboldt Park to compete for bragging rights for a full year. This 7v7 soccer tournament will end with only one winner being crowned. All teams will be playing hard to benefit the kids in Urban Initiatives’ sports-based youth development programs. The Corporate Challenge Cup spreads the love of the beautiful game and aligns with our innovative Work to Play program, which uses soccer to motivate children to adopt healthy lifestyles, develop stronger character, and reach higher academic achievement. The Corporate Challenge Cup is a unique event that features a true cross section of Chicagoland companies. With an estimated 150 soccer players from 16 companies like AbelsonTaylor, JLL, Kirkland & Ellis, Sidley Austin, and Storck USA, the Corporate Challenge Cup is truly a citywide event that highlights the Chicago corporate community’s commitment to giving back.